-20 to 55 degree C operating temp. Many small scale applications such as simple machines could benefit by using a programmable graphical interface along with a discrete and analog controller and I/O, but don’t have the panel space or the budget for separate components. The FT1A SmartAXIS Touch address this need by combining operator interface and control in a single compact package, all programmable with IDEC’s PC-based software. The FT1A Touch is available in 12 I/O and 14 I/O configurations with analog I/O expansion capability suitable for advanced analog monitoring and control. monochrome unit is rated at 740cd/m2. With 32 levels of brightness control, the backlight can even be adjusted according to the surrounding conditions. The built-in Ethernet ports allow the FT1A Touch to be configured as a Client (Master) or Server (Slave) on the Modbus network. Modbus RTU (Master) is also supported. With these capabilities, FT1A Touch can communicate with other PLCs or devices using Modbus protocol. With the embedded RJ45 Ethernet port, FT1A project file scan be remotely uploaded or downloaded over an Ethernet connection. Critical logging data can also be retrieved quickly. 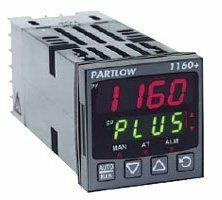 Using analog expansion cartridges, FT1A Touch 14 I/O can utilize 0-10V DC, 4-20mA, RTD and Thermocouple inputs. Up to three FT1A controllers (24, 40 and 48 I/O) can be configured as remote I/O slaves for the FT1A Touch, expanding your system’s potential. A maximum of 158 I/O can be achieved. With 10A contact ratings on all four of the relay outputs, the FT1A Touch 12 I/O can be directly connected to a solenoid valve or motor, which eliminates interposing relays and reduces wiring. Project files can be transferred between a USB memory stick and the FT1A Touch 12 and 14 I/O type. It is a quick and convenient way for an OEM to program multiple units and for users to quickly update ladder and HMI programs.